At St. Thomas More Catholic School, the early childhood classrooms offer an environment that encourages children to explore, question, and learn. The curriculum revolves around a child’s natural tendency to “learn through play,” allowing children to approach new concepts in a “hands-on” manner. Each child has the opportunity to follow his/her interests within the classroom community and be recognized as a special and unique child of God. It is important that each child feels respected, loved, and valued as the focus is on the development of the whole child in all areas: spiritual, fine motor, cognitive, physical, social, emotional, mathematical and critical thinking. As the primary teachers of their children, parents are valued as partners in education. Parents are expected to share their gifts of Time, Talent, and Treasure with the school community. Children learn and grow in a loving, nurturing, Christ-centered environment. Through stimulating, hands-on, small group learning centers, children can explore their interests, practice and strengthen fine motor, gross motor, self-help, sensory, and social interaction skills while learning important concepts in religion, language, literacy, math, science, music, and art. In addition, the children enjoy outdoor playground time each day along with specials classes. The Four-Year-Old Preschool classes have the opportunity to visit various specials, including Music, Art and P.E. Our Catholic faith is an integral part of our curriculum. Children build a strong foundation for spiritual growth as they learn prayers, Catholic traditions and values, Bible stories, songs, and observe changes in the liturgical year through daily routines, activities, visits to the church, and interactions with clergy, parish staff, and each other. Preschool students should bring a nutritious snack each day. If they are staying for wraparound time, parents need to provide a lunch from home. Preschool Classes do not wear school uniforms. Children may wear comfortable clothes for working and playing but must wear sneaker shoes. Children enrolling in the Three-Year-Old Preschool class must be three years old on or before August 31. Children enrolling in the Four-Year-Old Preschool class must be four years old on or before August 31. Children must be fully potty-trained without the use of “pull-ups” by the start date of school. It is assumed that children are also capable of managing their toileting needs with limited assistance. Each preschool class has one teacher and an assistant with a ratio of 10:1 for the Four-Year-Old Preschool classes and 9:1 for the Three-Year-Old Preschool classes. Lead teachers are licensed in Birth through Kindergarten or Elementary Teacher Education. Assistants hold either a teaching license or have had experience working in early childhood education. 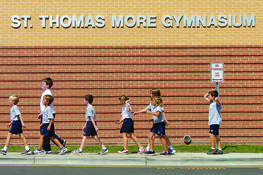 For information about admissions and registration, please visit the St. Thomas More Catholic School Admissions page located on the main website at stmcsnc.org/admissions. All questions about the Three-Year-Old or Four-Year-Old Preschool classes should be directed to the St. Thomas More Catholic School Admissions office at 919-942-6242.